One woman with an ambitious gaze fixed on her future and another with a dreamy eye towards an ever-increasingly distant past, both are unhappy. They’ve reached the place in their lives where they must act if things are to change. Lillian Hellman’s classic play The Little Foxes may be set in 1900 in the post-Civil War South but in Daniel Sullivan’s revival it hardly seems like all that much time has passed. Though the mechanisms by which the women in the play are dispossessed of their autonomy may have changed in the last century, the gaslighting, emotional and physical abuse, and overall dismissive attitude towards women still remain a 21st century phenomena. 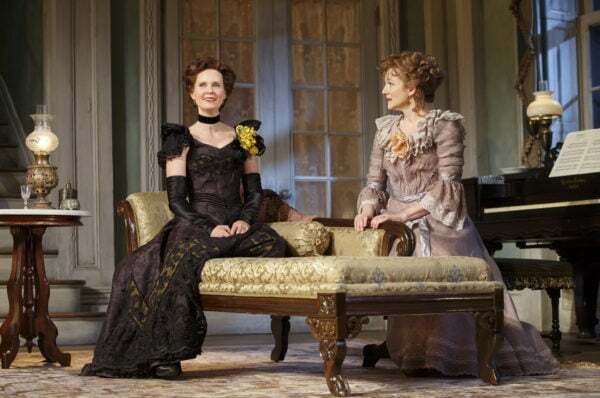 With the Cynthia Nixon and Laura Linney swapping the central roles in repertory, Hellman’s play still has much to show us about ourselves. She centers the play around the squabbles over money, power, and honor within a Southern family. Birdie Hubbard (Laura Linney during the performance I saw) is the overly-chatty, tipsy aunt who leads with her heart. She is always reminiscing about the days of her youth when she was a member of a leading aristocratic family and people were polite and kind. She is married to the cruel Oscar Hubbard (Darren Goldstein). Oscar, along with his brother Ben (Michael McKean), are plotting to put together a deal to bring a cotton mill to town and make themselves even richer in the process. They need one more partner to invest. The Hubbards’ sister, Regina Giddens (Cynthia Nixon), promises that she will get her husband Horace (Richard Thomas) to come on board the project. Hellman gives us a clear idea of why these women are the way they were but she does not reduce them to pat psychological profiles. With just enough exposition and the carefully drawn performances of Linney and Nixon, these women are vividly complex. Their wants and needs are in conflict with society’s expectations and roles for them. In different ways that struggle is snuffing the life out of both of them. One chooses to fold, the other to fight. Regina was forged in a cauldron of cheating, lying, and thieving which the Hubbard family excelled at. Learning first from her father and then from her brothers, the selfish, self-promoting machinations of the Hubbards are the stuff of town legend. That Regina plays these games as well as, if not better than her brothers, speaks to her own savvy but that she must gamble with funds that are not in her grasp is the curse of being born a woman. This is where the drama lies. Nixon plays Regina smooth and steely. No histrionics or even raised voices. Like so many women before her (and since), she controls her voice and her body to remain calm and steady so she will be heard, recognized, and not minimized. Yet, as Hellman play reminds us, and the women, no matter whether they behave or not they will be diminished and reduced by the men around them. When Regina thinks for a moment she has the upper hand over her brothers, Ben, as played by McKean with utter disgust, looks down his nose at her and scoffs at the notion that she needs to be listened to. He reminds her over and over of her mother’s advice that “it’s unwise for a good-looking woman to frown. Softness and a smile do more to the heart of men.” As he says this, I could not help but think of the men on the street today who think it advisable to tell women to smile. There is always someone there trying to shape you into the thing they want you to be and mold you against your will. Regina may connive alongside her brothers but she is different from them. She’s had to work hard to stay in the room. This is a society that says her machinations should not reward her as it’s done her brothers. Her defiance defines her and sets her apart from these entitled men. Birdie is a cautionary tale of another making. She married into the Hubbards and they took her family’s estate. That’s all she was to them. She pours all her affection and love into Regina’s daughter Alexandra (Francesca Carpanini) who is the only one who might even appreciate it. Linney bubbles and smiles through pain as family member after family member scolds her or ignores her. But if her niece can escape her wicked family with just some of Birdie’s kindness Birdie’s efforts will not have been in vain. The cast is strong across the board, providing all the ballast the play needs to keep the tension between the family members taut. Each action has a consequence within this family circle and these actors make us feel each tug. For all the cruelty on display, Sullivan’s production does not judge or condemn Regina. We are all still players in an inequitable society and whether we find Regina’s behavior to be questionable or noble may lie in how we view the fairness of her fight. Cast includes Laura Linney, Cynthia Nixon, Darren Goldstein, Michael McKean, Richard Thomas, David Alford, Michael Benz, Francesca Carpanini, Caroline Stefanie Clay, and Charles Turner.